In food news this week, we discuss The New York Time’s recent decision to put most of its Cooking section content behind a pay wall. Marisa is loving a hearty slaw-type salad for this summer’s meals, either as a side or a base for an entree style salad. This week in our What We’re Digging segment, we talk about salad chain Sweetgreen. In food news recently, it was widely reported that Amazon bought Whole Foods. We speculate about what this will mean to us and grocery shoppers in general. 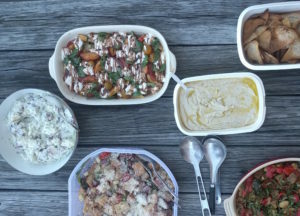 In the dog days of summer, not even we food enthusiasts want to crank up the oven or stand over the stove. This is when we return to our old love: stuff on toast. Avocado is just one of the many lovely things you can enjoy on top of toasted slice of bread. We share our faves. We have told you many times that beans cooked from dried are best, and that’s still true. But we’ve been letting ourselves loose in the canned bean aisle lately and enjoying the convenience. Canned beans taste great, too. We’ve got an interview with Emily Paster, food blogger and cookbook author based in Chicago. 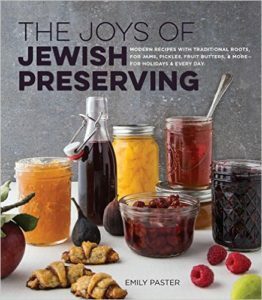 Her new book, The Joys of Jewish Preserving, will be hitting bookstores any day now. New segment alert: We’re going to try wrapping up the show by telling you about something in our kitchens that we are just loving right now. Our first pick? Spindrift beverages.